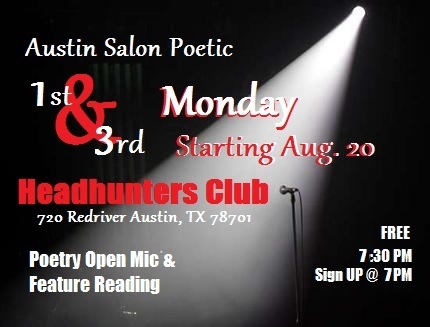 Virgogray Press and the Austin Poets Association present a new poetry open mic event called Austin Salon Poetic to be held on the 1st and 3rd Monday of the month beginning August 20, 2012 at Headhunters Club and Lounge located in downtown Austin, TX at 720 Red River Street, 78701. We are glad to be involved in presenting a poetry open mic for the Austin community to enjoy or participate. Headhunters Club is pretty much a classic venue, standing in the Red River District for years on the corner of 8th and Red River. One may associate “headbanging” with “Headhunters,” and Headhunters is a rockin’ live music venue that does serve up metal, rock and alternative local, regional and touring acts,but Headhunters theme is more akin to a Tiki type bar and lounge, with an amiable staff and good drinks. The Austin Salon Poetic, while primarily a poetry open mic will feature local, regional and traveling poets who wish to share their words with an Austin audience. All are encouraged to come and participate or just spectate, check out your favorite local spoken word artist and poet or just have some drinks and socialize. The Salon will be held on the intimate “Cannibal Stage” (no zombies, please). Doors open at 7 PM, at which time you may also sign-up for the open mic which shall begin promptly at 7:30 PM, unless we have a feature poet presenting their work. The open mic will be sign up and round robin till the end of the event. Free speech is encouraged, as well as all styles of poetry. Good news, glad to hear it. Maybe somebody will record video at the Salon of these readings and put it up on YouTube or something. Also I think zombies should be allowed to read their poetry, too. Equal rights for the undead, you know.